It's very sad when anyone is given the bad news that they have cancer, but it is even worse when it's a child who is diagnosed with it. The treatment for children with cancer is barbaric and a terrible experience for the child. Just ask any parent who has a child with cancer. And after months or even years of being made sick by the "doctors" and their "medicines", some children are unsuccessful with their treatment. For those unsuccessful children there is one option given to them, go home and die. This is the story of one of those children. Meet Logan. 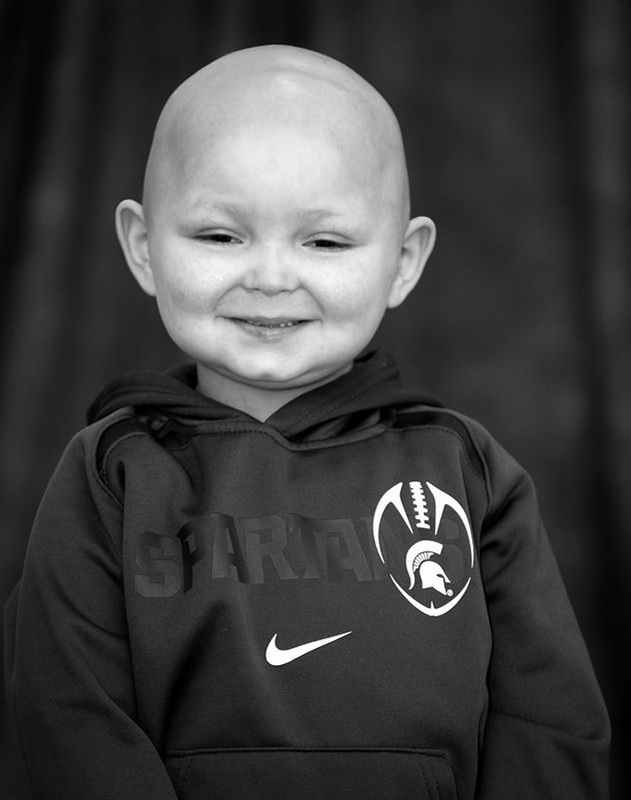 He is a 6 year old leukemia patient from Michigan. On April 16th 2009 at the age of 1 he was diagnosed with B cell acute lymphoblastic leukemia. This was obviously devastating news to his family. So at the age of 1 he started chemo and radiation. Then in March 2011 during his treatment he relapsed. He received higher doses of chemo plus radiation after this first relapse. In June 2013 Logan once again relapsed. After the second relapse he received 2 more weeks of radiation and chemotherapy followed by a unrelated donor bone marrow transplant on October 16th 2013. Sadly on January 13, 2014 doctors told Logan's family that he had relapsed yet again and that there was nothing more they could do for him. The doctors have sent him home giving him 3-6 months to live. Even though he was sent home by his doctor to die his family isn't giving up without a fight. 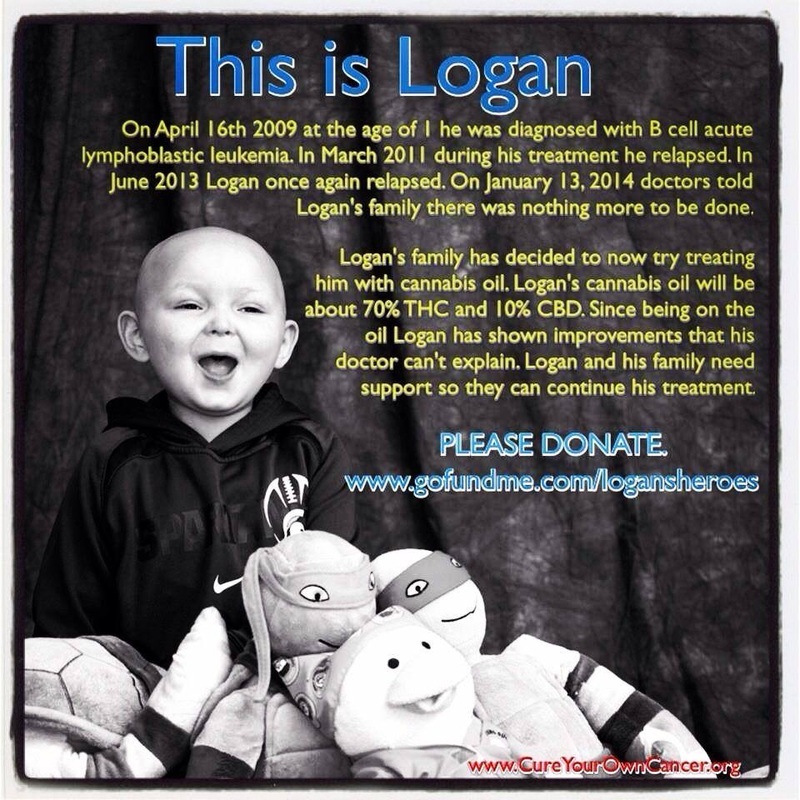 Logan's family has decided to now try treating him with cannabis oil. They have chosen to treat him with high THC cannabis oil. Since being on the oil Logan has shown improvement that his doctors can't explain. To help Logan and his family CureYourOwnCancer.org held a month long T-shirt fundraiser from 2/9/14 - 3/9/14. I had a "Team Logan: i KILL cancer" T-shirt designed so I could sell it and raise money. For every T-Shirt sold CureYourOwnCancer donated $20 dollars to Logan and his family. My goal was to sell 50 shirts and raise $1000. We didn't quite make the goal but we came in close at just over half the goal selling 26 shirts and raising $520! I am glad that CYOC was able to help Logan and his family out in their time of need. It's not much but every little bit helps. Below you will find a written testimonial from Logan's mother Kimberly Rulapaugh explaining Logan's story as well as a video. You will also find a link to Logan's "Go Fund Me" page. 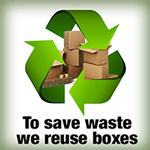 Please click the link and donate what you can. It will help save this little boys life. I didn't know that April 15th 2009 would be the day my life would change forever. Logan was only 1 years old when we took him to the local emergency room around midnight because his temp was almost 105 degrees. His blood work was done then a doctor came in to tell me the devastating news no mother wants to hear. They think it's leukemia. His white blood count was 53,000 with blast present in his blood. He was admitted that night then transferred by ambulance to Sparrow hospital. He had a bone marrow aspiration and lumbar puncture to confirm he has high risk acute lymphoblastic leukemia B-CELL. Now Logan had to have a line placed into him to receive all the chemo he was about to go through. I was told his survival rate was good at around 85%. They told us we would have to go through chemotherapy for 3 years. He achieved a remission within 2 weeks. He did well other than some infections and surgeries throughout. March 22, 2011 5 days before his 3rd birthday I received a call from Logan's oncologist to inform me the leukemia is back. This time only it was only in his spinal fluid. This is referred to as an isolated CNS relapse. We met with the doctors to find out we now would now have to do a more intense therapy stronger chemo and two weeks of radiation and this would go till the end of 2013. His survival rate had now dropped to around 60% by this time. He responded fairly well to most of the treatment other than surgeries and infections. 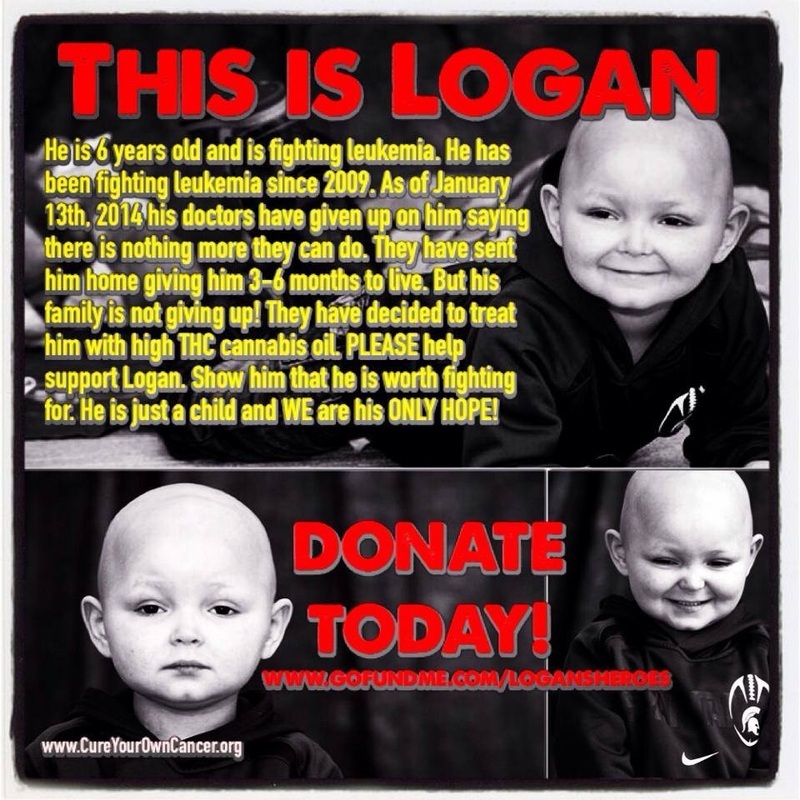 In June 2013 Logan was admitted into the hospital for an infection and he had a couple blasts in his blood. A few weeks later his doctor did a lumbar puncture and bone marrow to check for relapse and once again he relapsed only in his spinal fluid. We were told this is rare and that they wanted us to go to Motts children's hospital in Ann Arbor for a bone marrow transplant consult. Logan faces great risks with transplant but higher risks with just chemotherapy. His survival rate with only doing chemo was 5-15% however with transplant it was around 15-30% but they were not even sure if transplant would work due to it not being a relapse in his bone marrow. It was a 50/50 chance and possible graft vs host disease, but I knew there was no other choice. His body and organs could not handle much more chemo. Before the transplant they did two weeks of radiation to his brain and spine. For the week before transplant they did chemotherapy. Luckily a 10/10 unrelated donor was found. October 16, 2013 Logan received his transplant and the doctors were amazed by how well he did. He was released 2 weeks after his transplant but we needed to stay local for 3 months due to the risk of complications and graft vs host disease. He had some skin graft vs host a really bad rash head to toe. A little is good but if it gets to bad it can attack his organs. So he was placed on steroids for this. Logan was on multiple medications from transplant including IV'S that I would do myself at home. Around the end of December we were able to take him back home because he was doing so well plus he missed his little sister and family back home. January 13th, 2014 Logan had a scheduled doctors appointment as well as a bone marrow aspiration and lumbar puncture. Doctor came in to once again say he has relapsed his white blood count was 20,000 with 38% blasts in his blood. He had around 90% cancer in his bone marrow this time but his spinal fluid was fine. The doctors sat down with us to talk about further options. I have stated over and over again there will be no more chemotherapy because this has been his life for 5 years now. They have a clinical trial phase 1 intense chemotherapy that will give his toxicity and kill him. I refused chemo so the doctor placed him on palliative care. His survival rate is 0% no matter what I would have chosen. I told them I was going to do a natural treatment instead. Let's face it, they just told me that Logan has 3 months to 1 year to live and sent us home. The O'Toole family I met that same night after driving 2 hours home then another hour to get there. Who would have known in the short amount of time these people would have such a impact on my family. They are more than our friends they have become our family! Logan started cannabis oil that same night. He slept a lot at first but 4 days later his blast went from 38% to 8% with no other treatment but cannabis oil. The first oil we gave him was lower than expected in THC but we did see some positive results. 2 weeks later at another appointment his blast were 30% again. At this point we have decided higher a THC oil is needed. I have upped his dose and within a few days he went from .5 to 1ml. Logan started having some signs of graft vs host disease with a rash on his skin and stomach pain. Right now he is currently in the hospital and on steroids at this time. The first 4 days he stopped eating all he could do is puke and poop. Logan is still on the oil and finally eating and drinking again.